Making Stainless Steel Custom Wire Racks for Science! A lot of the time, Marlin Steel is tasked with creating custom wire baskets to fit a variety of different manufacturing processes. However, one recent request from a company that specializes manufacturing life science and laboratory products was a bit different. In this case, the client needed a custom wire rack assembly that would fit a set of shelves loaded with products. This wire rack system would hold up to 100 pounds of products at a time—50 pounds on each shelf, with two shelves per wire rack assembly—and be connected to the inside of an existing chamber/enclosure using two points at the top left and top right of the chamber. The shelving also needed to be adjustable to some degree for future products that might require shelves inserted at different heights. As different products might be processed using the racks, the manufacturing process listed for the client’s current needs were likely to change, as well—meaning that the wire racks needed to be resistant to more than just the stresses of the current manufacturing process. 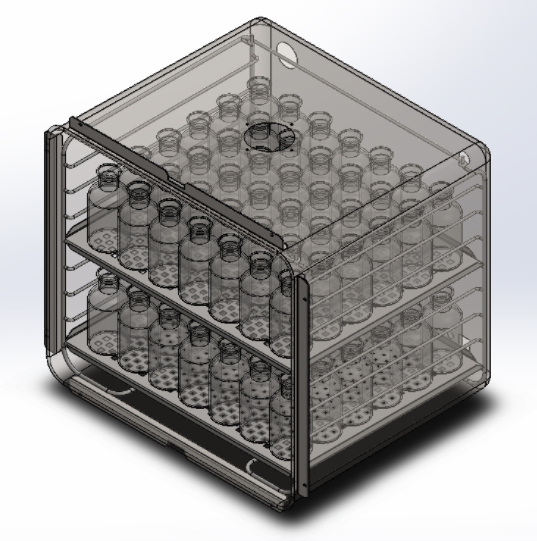 Considering the potential for use in processes not yet defined by the client, Marlin’s engineers wanted to make this custom wire rack design as resilient as possible to a wide range of chemicals, temperatures, and other stress factors. This would help ensure the future viability of the wire racks if the client changed manufacturing processes later on. The simplest way to accomplish this was to use a stainless steel alloy that would be highly resistant to a variety of chemicals & temperatures—such as grade 304 or 316 stainless steel. Stainless steel wire racks would have more than enough tensile strength and impact resistance to handle most loads that would fit in the specified enclosure, while also withstanding a wide variety of potential chemicals that might be used in the client’s manufacturing processes. The high tensile strength of stainless steel also had the benefit of making it easier to create smaller, lighter wires for the racks—increasing portability and ease of handling. This would make it easier to install the wire rack assembly in the chamber and remove it later. To further enhance durability and weight tolerance, cross retainer bars were added to connect the two main rack assemblies on either side. This helped provide support and make sure the weight of held parts on the shelves would be evenly distributed between the two sides. In this design, the shelves would be removable, and the current load was a set of bottles that, given the size of the enclosure (~18”), could only be stacked two sets high in the enclosure. However, in the future, other parts could be held in the enclosure that might be smaller—so the design had to be adjustable. To make it easy to change out held parts, each side of the rack had eight different shelf rests—allowing up to eight narrow shelves of parts to be held at once. This made switching the products being held as easy as taking out the shelves and putting in new ones loaded with different parts. By taking into account potential future uses for the custom wire racks, Marlin’s engineers could provide the client with a design that was moderately future-proof—minimizing the total cost of ownership (TCO) by making sure the wire form would last for years to come and have uses other than the one it was initially designed for. Learn more about how Marlin creates Quality, Engineered Quick® for manufacturers in industries around the globe! Marlin Steel is	a leading	manufacturer of	custom‐engineered	products from steel	wire and sheet metal. Its industrial material	handling	containers serve many industries including	aerospace, defense, medical	and	automotive. 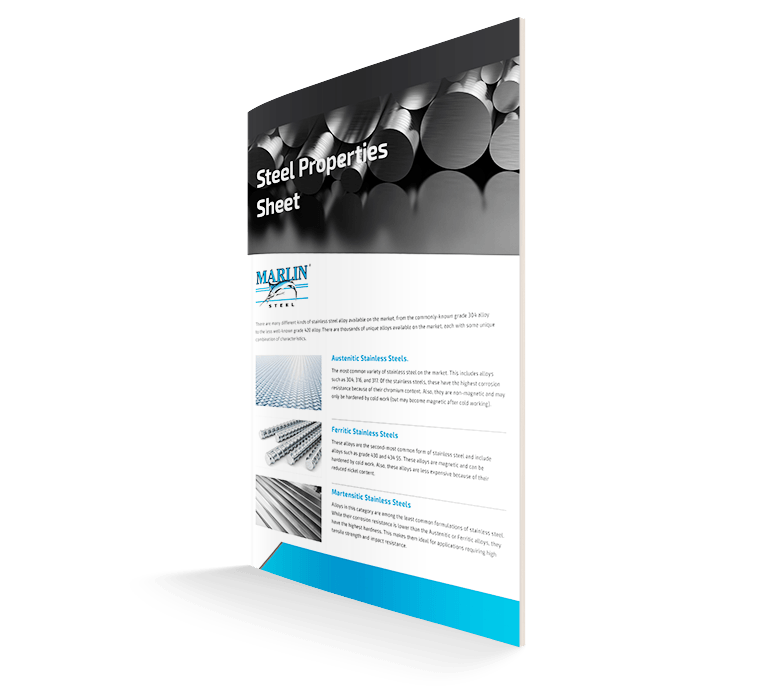 A summary sheet comparing key characteristics of commonly used stainless steel alloys.